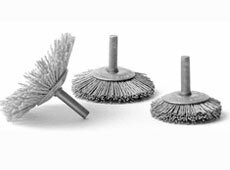 Size 1 1/4"1 3/8"1 1/2"1 3/4"2"2 1/2"3"
Note: Speeds greater than 8,000 RPM do not enhance operation of brushes rated at 25,000 max. safe free speed. Size 1 1/2"1 3/4"2"2 1/2"3"
Note: Speeds greater than 8,000 RPM do not enhance operation of brushed rated at 25,000 max. safe free speed. 1-1/4" thru 3" Diameters. Abrasive nylon is excellent for light deburring, edge blending and general surface finishing. 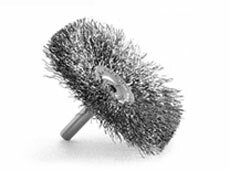 Abrasive nylon mandrel mounted brushes are safe, non-reactive and offer an excellent alternative to traditional steel filament brushes. 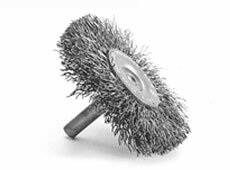 The brushes have an integral 1/4" shank which makes them ideal for use in automated and CNC equipment. Please consult the abrasive filament chart for other grits and abrasive types. 1-1/2" thru 3" Diameters. Abrasive nylon is excellent for light deburring, edge blending and general surface finishing. 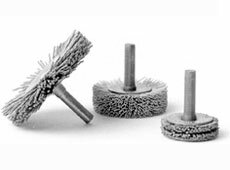 Abrasive nylon brushes are safe, non-reactive and offer an excellent alternative to traditional steel filament brushes. The brushes have an integral 1/4" shank which makes them ideal for use in automated and CNC equipment Flared design allows finishing on undercuts, shoulders and hard to reach areas. Please consult the abrasive filament chart for other grits and abrasive types.